I must have implemented linked list processing and/or stacks in almost every programming language I have had the opportunity to learn—scripting languages included. In this paper, both recursive and iterative binary tree algorithms are presented in the 4Test scripting language. My first exposure to computer science was in the Data Structures course I took at Monmouth College. The book for the course was The Art of Computer Programming: Volume 1 / Fundamental Algorithms which is sometimes affectionately referred to as Knuth Volume 1. Fortunately for us in the class, the professor skipped Chapter 1, Basic Concepts and went right into Chapter 2, Information Structures. During the course, I wrote all the assigned linked list and binary tree programming projects in IBM 360 Assembler. Data are stored in singly linked lists as nodes made up of both a datum portion and a link portion. The link portion is a pointer to the next node in the list. The memory locations are not required to be sequential. When a new node is added to the list, the link in the last node is updated with a pointer to the next node in memory. Conversely, when a node is removed from the list, the deleted node or memory is returned to the free list and the link portion of the preceding node is updated with a pointer to the node which succeeded the deleted node—basically a pointer is swapped. A binary tree is a special type of linked list. Nodes in a binary tree contain a datum portion, as in a singly linked list, but also contain both a left link and a right link. The left and right links are themselves pointers to new linked lists which are branches of the tree. Binary tree data structures are associated with efficient sorting and searching algorithms. Whenever I develop scripts in SilkTest I normally create an options file (.opt) which is configured with a reference to an include file (.inc) that in turn contains references to all other include files required to support the 4Test script (.t). 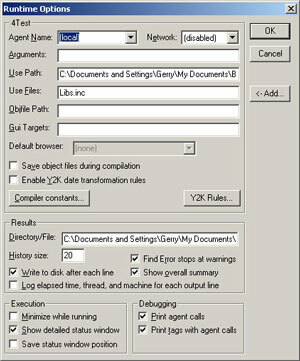 The Use Files parameter in the Runtime Options contains the entry Libs.inc as shown in Figure 1. The Libs.inc file contains a use statement for the additional include files: Algorithms.inc and Functions.inc. By using this technique only the Lib.inc file would need to be modified if new include files are added or existing ones deleted. // Library (.inc) file which contains include files used by binary tree script. Build_BTree is a procedure which inserts nodes in a binary tree. For our purposes, the data structure used to implement the binary tree is an ARRAY OF ANYTYPE. The procedure populates the array by reading items from a list and then assigning each item to an array element or node. Assignments are made based on whether the new value is less than or greater than the value in the node being examined. If the new value is less than the value in the examined node, then search the left branch. If the new value is greater than the value in the examined node, then search the right branch. Values are inserted until either the binary tree is full or the list is expended. Duplicates are discarded. NestedSet_BTree is a procedure which computes the nested set representation of a binary tree structure. The procedure is an implementation of Algorithm T from Knuth Vol. 1, page 317. For this paper, I converted the iterative algorithm from inorder to preorder and modified it slightly in order to implement the nested set computation. ComputeDepth_BTree is a function which computes the depth of a binary tree. The depth of a binary tree is commonly defined as “The number of nodes along the longest path from the root node down to the farthest leaf node.” The maximum depth of an empty tree is 0. // Algorithms to manipulate binary tree data structures. // Create a Binary Tree from a list of input. // btTree The Binary Tree to create. BTree. // Recursive Binary Tree traversal. // Returns the binary tree values in pre/in/post order. // btTree Binary Tree structure. BTree. // iNode Node to traverse. INTEGER. // ORDER Traversal order. SearchOrder. // Computes the binary tree as a nested set. // Ref. Knuth Vol 1, 2nd edition, page 309. // Algorithm from Knuth Vol. 1, 2nd edition, page 317. // Knuth's Algorithm T modified from inorder to preorder. // sParends Nested Set representation. STRING. // Computes the depth of a binary tree. // Based on NestedParends_BTree procedure. // iDepth Computed binary tree depth. INTEGER. if btTree[P][DATA] == nil //empty tree? ConvertListToCSV is a function which converts the binary tree to CSV format. This function is called by Save_BTree. ConvertCSVToList is a function which converts the contents of a CSV file to a List. This function is called by Load_BTree. Initialize_BTree is a procedure which initializes the array representing the binary tree. Print_BTree is a procedure which dumps out the contents of the array representing the binary tree. Save_BTree is a procedure which writes the binary tree to a file in CSV format. Load_BTree is a procedure which retrieves the binary tree from a CSV file into a List. // Miscellaneous binary tree support functions. The BTree.t file is the 4Test script which manipulates the binary tree. The script exercises all the previously described procedures and functions. // Script which manipulates binary trees. BTree.t script results are displayed below.